Admire Kamudzengerere’s artistic style—quick, frenetic—seems to flow directly from his demeanor and to help him remember who he is. In late March, the artist Admire Kamudzengerere held a series of provocative auditions for a new performance. He and his collaborator, Rachel Monosov, asked dancers to respond to various questions with physical, rhythmic movement. How does it look, for example, to have a culture put upon you? How do you represent a transformation from strength and power to weakness? The four successful applicants performed in the pair’s work, Transcultural Protocol, a choreographed three-act meditation on tensions between different cultures, which debuted at the Venice Biennale this May (with stateside performances to be announced). 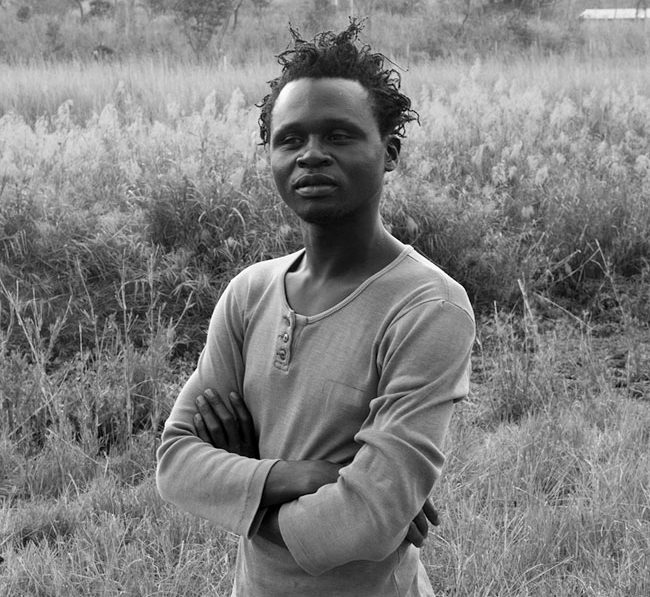 Kamudzengerere is one of the four Zimbabwean artists selected to represent his country. The performance aims to raise issues of racism and gender discrimination as four bodies—male and female, black and white—shove each other. “Is this scary, you guys? Is this scary to touch on such a fiery topic right now?” the gallerist Catinca Tabacaru asked during a public conversation at her gallery, where she was exhibiting a solo presentation of Kamudzengerere’s work. “Bring it,” he responded quickly. The biennale is one of the premiere events for the international art world, attracting curators, dealers, artists, and writers to Venice every two years. As anger still looms over Dana Schutz’s painting of Emmett Till in this year’s Whitney Biennial—and many forms of discrimination continue to trouble our country and others—Kamudzengerere and Monosov staged a performance of aggression to take place right before people’s eyes. At the entrance to their rehearsal studio, a couch and desk offered the pair space for resting, talking, and working out the details for the show. Above the desk, they’d taped pictures of famous artworks from history, among them the Greek sculpture Discobolus, or The Discus Thrower, and surrealist photographer Man Ray’s picture of hands painted black and white, Hands painted by Picasso. Throughout the first portion of the performance, four dancers on pedestals contort their bodies into shapes resembling these images. The Discus Thrower, Monosov explained to me, was one of Hitler’s favorite sculptures for its representation of an ideal form. In Hands painted by Picasso, the paint is intended to make the hands look like gloves, but also conjures the practice of blackface. Thus, Transcultural Protocol intends for the dancers to reclaim problematic, culturally loaded forms—or at least to transpose them onto their own bodies. “The whole piece is coming from the idea of tensions,” says Kamudzengerere. During the second act of the performance, the two female dancers and two male dancers (one black, one white in each case) lean their shoulders against each other, shoving back and forth. They also reach their bodies into the surrounding audience’s domain. Monosov describes it as a “psychological test for the audience.” These interactions with the audience and each other are meant to challenge viewers to examine their own prejudices, judgments, and responses to confrontation. Kamudzengerere also sees the performance itself as a way of “owning time.” At the Venice Biennale, Kamudzengerere exerted control—if just for an hour—over an audience culled from the wealthy, sophisticated, international art-world elite. He hoped to induce discomfort. If he can’t literally force people to walk a mile in your shoes, he would at least confine them, focusing their attention on the inequality you’ve felt deeply and which can otherwise be so easily ignored. The contrast between control and abandonment, embodied in Transcultural Protocol, is also evident in Kamudzengerere’s drawings. The dance fits into Kamudzengerere’s larger, multidisciplinary practice where even works on paper evoke movement and rhythm, and duality creates a sense of tension. The art recently on view at Tabacaru’s gallery included ink monotypes comprised of Kamudzengerere’s quick, frenetic lines. The work Unmasking is a collection of several hundred Post-It notes that feature drawings of Kamudzengerere’s face in shades of red, black, and brown. Doubled over themselves many times to create recognizable facial elements—eyes, ears, hair, nose, mouth—the lines evidence the hurried, fluid hand that created them. Each time he shows the work, Kamudzengerere arranges the Post-Its into a different configuration on the gallery wall (in this iteration, the shape resembled the United States). Crucially, he says, the prints are two-sided, which underscores the divergence between what’s seen and what’s concealed. Flip one of the Post-Its, and you’ll see the pencil drawing from which the print was made. The work’s title further emphasizes this division. Kamudzengerere’s style of drawing seems to flow directly from his demeanor. Short and lithe, he speaks softly and passionately about his work, but his hands and eyes are always engaged. His fingers extend, or his arms glide in front of his body, conveying movement as his body maintains a kind of constant buzz. In early April, at his temporary apartment and studio in Bushwick, Brooklyn, Kamudzengerere explained to me how he developed his artistic style out of necessity. Back home in Harare, the artist had trouble convincing his friends to sit for his drawings. Instead, he began drawing people he saw on the street. They were cheap and easy models, but Kamudzengerere had limited time to capture them before they noticed or walked away. When I visited his studio, a flattened cardboard box that looked like the beginning of a collage lay on the ground. On top, he’d pasted his Metrocard, receipts, an airplane ticket, and other relics of daily life among colorful prints of his face made with mud from Zimbabwe. The self-portraits were printed on old phone-book pages. Kamudzengerere employed a similar style in Open Line, the largest work on view at Tabacaru’s gallery. At 120 x 218 inches, the series of old Harare phone-book pages, with colorful markings and the mud prints, extended across a full wall. Kamudzengerere began making self-portraits after his father died in automobile accident in 2012. A front tire of a public transport van burst, sending the vehicle off the road with his father inside. At the time, Kamudzengerere was in residency at the prestigious fine-arts school Rijksakademie in Amsterdam and couldn’t afford to fly home. He tried to focus on his work but found himself unable to push away the tragedy. Eventually, he accepted that he was never going to see his father again but was bothered when he couldn’t clearly recall the look of his father’s face. “I really felt like my mind was blocking things from me,” he said. He began drawing his own face, in hopes of finding traces of his father there. The repetitive practice helped him access his memory. He speaks more of experimentation than of deliberate developments in his oeuvre. As for artistic references, he cites three European artists who have all been dead at least 70 years: Francisco Goya, Edvard Munch, and Gustav Klimt. In particular, he says he loves Klimt’s The Kiss for the way it captures a specific moment. “It freezes me,” he says—a rare pause, perhaps, in his otherwise constant movement. Like Klimt, Kamudzengerere also demonstrates a predilection for vivid, memorable colors. His practice seems to still be discovering its focus, the artist himself still gaining confidence. “I don’t even know if I am an artist,” he laughed once. “Anyone can show at the Venice Biennale.” He only seemed to be half kidding. Kamudzengerere’s version seems consistent with his view of himself as an outsider. Similarly, he and Tabacaru gave me different versions of the story of how they came to work together. The artist recalls that Tabacaru wanted to show work by one of Kamudzengerere’s students and then brought him onto the roster as an afterthought. The gallerist, surprised at this version, claims that she was eager to show both artists’ work and began representing them simultaneously. It seems rather certain that Kamudzengerere has experienced plenty of hardship, but like his self-portraits, his tales about himself are—however earnest—amplifications of memory. By 2003, he had begun to check out applications for the Rijksakademie, but life and Zimbabwe’s political instability got in the way. Crippling inflation hit the country, and Kamudzengerere left Harare to set up and run his own trading service in Nyanga, a highland town more than three hours from the city. He’d motorbike back and forth, exchanging Nyanga’s produce for Harare’s blankets, clothing, and books. As Zimbabwe’s currency continued to plummet in value, Kamudzengerere insulated himself by dealing in fruits, potatoes, and chickens. The detour worked its way into Kamudzengerere’s art. Inspired by Nyanga’s beauty, he started drawing landscapes. On his journeys, he’d become covered in thick mud. He decided to use the material for color—a technique that he still employs in his self-portrait prints. In 2007, he moved back into Harare and joined the National Gallery as an instructor. By this time, according to Kamudzengerere, many of the country’s artists had fled to South Africa, Botswana, and Namibia—places where they were more likely to find jobs. He says that the artists who stayed in Zimbabwe, however, started “working in different ways…. For you to survive, you had to adapt.” He cites Gareth Nyandoro and Masimba Hwati as two artists who began incorporating found materials into innovative new sculptures. Both represented Zimbabwe in the 2015 Venice Biennale and have gone on to gain further acclaim. Can the Pain of Others Be Transmuted Into Art? After years of teaching at the National Gallery, Kamudzengerere applied for the Rijksakademie residency. Out of more than 2,000 international applicants, he received a place among 11 other artists for the 2012 to 2014 term, and was the second Zimbabwean artist to attend the program. “It was a huge culture shock, being in Europe and then coming from Harare and then going to museums and seeing all this art.” Ever eager to learn, he explored new media: video, performance, and installation. He traveled around Europe and visited museums, observing many new cultures. Yet, he always felt drawn back to Zimbabwe. After the residency ended, he returned to Harare and to teaching. One day, a shaman, who was also a leader of the local arts organization Dzimbanhete Arts Interactions, hosted a ceremony for the group. Kamudzengerere says he was friendly with the shaman but had never before been to a ceremony. Monosov took some snuff (tobacco mixed with herbs), couldn’t breathe, and ran outside. Inexplicably, Kamudzengerere, who had been sitting next to her, ran after her and the pair began talking. “We’re coming from completely different cultures and backgrounds,” says Monosov. “But we found a lot of the same questions and problems with the world. From these extremely different worlds came this curiosity.” It was Monosov’s perspective on Israel, where she lived as a child and attended university, which resonated most with Kamudzengerere, who saw parallels to Zimbabwe’s conflicted boundaries. Besides the collaboration with Monosov, Kamudzengerere’s time with the group also cemented his relationship with Tabacaru. The gallerist brought back drawings that she included in two gallery shows in 2016. All of Kamudzengerere’s work sold out. Tabacaru herself is supporting Transcultural Protocol, the Venice Biennale show, with both feedback and financing. She describes the dynamic between both artists as respectful and united, able to withstand creative differences.